Following the publication of J.T. 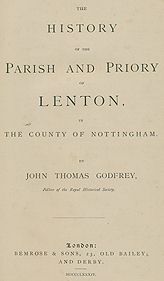 Godfrey's History of the Parish and Priory of Lenton in 1884 the Nottingham Daily Express produced a review of the book. Amounting to almost 9,000 words, their 'notice' appeared over the course of four weeks and can be found in the editions dated 18 December 1884; 27 December 1884; 5 January 1885; and 12 January 1885. We have transcribed the newspaper article for modern day readers and offer it as an introduction to Godfrey's work. The original article was not divided into paragraphs nor did it have any subject headings - we have added these ourselves. There were no illustrations for those reading the newspaper version; these you see here are taken from the pages of the actual book. We are aware that both John Godfrey's book and the newspaper's review of it contain information that is now considered incorrect and would be happy to make available a concluding section where suggested corrections to the text might be added. As this is quite a long article we have divided it into two sections. Click on Part 2 for the second section. No more welcome addition to our local annals could have been made than a history of Lenton and its ancient Priory. Appearing as it does, side by side with the selections from the Nottingham Corporation Records now publishing, the glimpses of the social life of our ancestors afforded by the one help to throw light on the incidents recorded in the other. 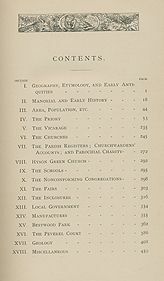 When we consider the important position among the monastic institutions of the country occupied by Lenton Priory, its wide ecclesiastical jurisdiction, and the fact that it The contents page from the book.derived its revenue from estates distributed over seven counties the wonder is that its history has not been written before. Such references to the Priory as we are already acquainted with are scattered up and down among our local histories. But these references are frequently copied from some previous writer without comparison with the originals, and consequently are not in all cases accurate. The work now before us owes its origin, as we learn from the preface, 'not with the idea of satisfying any literary ambition' on the part of the author, but rather with the view of contributing 'a chapter in a much needed history of the county.' Another good reason why Mr Godfrey should have made the history of Lenton his theme, is the fact that it is his native place. We may safely take it, then, for this reason if no other, that nothing has been left undone, or unnoticed, that would have in any material degree contributed to the elucidation of the historical events connected with this area included by this parochial history. And this impression is fully borne out by a glance through the index at the end of the volume. The book is published by subscription, and only 250 copies of it have been printed. The work is divided into eighteen sections or chapters. The first section describes the geographical position of the parish, its relations to the parishes by which it is surrounded, and the early antiquities found within its borders. Then follow other sections devoted to the manorial and early history; the vicarage, the churches and chapels; the parish registers, churchwardens' accounts, and parochial charity; the fairs, the inclosures, local government, manufactures; and the geology. Another section gives an interesting sketch of the ancient Court of Peverel, which had its courthouse in this parish. As might be expected, a considerable portion of the work is devoted to the history of Lenton Priory, and the numerous historical documents that have been laid under contribution in connection therewith indicate a very considerable amount of research. Previous to the year 1877 the parish of Lenton, consisting of Old and New Lenton, Bestwood Park and part of the ecclesiastical district of Hyson Green, the parish at that time comprising about 6,327 acres. When the parish of Lenton was annexed to the borough of Nottingham in 1877, Bestwood Park was detached, and the A drawing of the stone axe head found in Wollaton Park area was consequently reduced to 2,615 acres. In 1881 the parish contained 1,887 inhabited houses, with a population of 9,246 persons. The ancient history of Lenton may be said to date back as far as the Neolithic age, for amongst the earliest antiquities that have been found in the parish is an unusually large stone axe, which was met with some years ago in the sand hills in Wollaton Park. It was perforated for a shaft, and, besides being smoothed and rounded, was curiously grooved. Although it is almost certain that Lenton was not a Roman station, traces of Roman occupation have been met with. These consist, as usual, of coins, fragments of tiles and pottery, and bronze ornaments found on the site of what appears to have been a Roman country villa, in the high ground near Highfield House. The old inhabitants of Lenton had a tradition that a fierce battle was fought between the Britons and the Romans in the meadow at the foot of this hill, and that the Britons were victorious, though they suffered severely. The skulls of horses as well as human remains met with occasionally in the vicinity are thought to confirm this tradition. Here, too, about fifty years ago, a Roman bronze sword was found, lying near the remains of a human skeleton. At a later period the sloping ground on the south side of Cut Through-lane which overlooks the meadow, formed the site of the now extinct village of Keighton, which appears from the Priory records to have fallen into decay as early as the year 1387. Two other villages that have long since disappeared once existed in this part of the parish. One was the village of Morton, which is conjectured to have been situated somewhere near where Dunkirk Farm now stands, and the other was Sutton Passeys, which occupied the low ridge that divides Spring Close from Derby-road. Morton had a manor, which is supposed to have comprised that part of the parish lying between the river Leen and the Trent. The manorial history of Lenton may be said to commence with the Domesday Book. From this it appears that certain of the lands of the parish were held by the King, while the greater part had been granted to William Peverel. 'Peverel's connection with the county of Nottingham commences very shortly after the Norman Conquest. In 1068, the newly erected castle of Nottingham was confided to his charge; and at the time of the completion of the Domesday Survey, he was lord of one hundred and sixty two manors in England, and possessed in Nottingham alone, forty-eight merchants' or traders' houses, thirteen knights' houses, and eight bondsmen's houses, in addition to ten acres of land granted to him by the King to make a wall round the town, and the churches of St. Mary, St. Peter, and St. Nicholas, all of which he gave to Lenton Priory.' The manor continued in the possession of the prior and monks of Lenton until the suppression of religious houses in the time of Henry VIII. After the dissolution the manor was retained by the Crown until about the commencement of the reign of Charles I, when it was granted to the Corporation of the City of London. In 1628, the manor, together with the ancient fair and royalties, privileges, rents and services, was granted in fee farm to four citizens of London, who were to act as commissioners for the Lord Mayor, aldermen, and commoners to sell and dispose of such manors &c., as had been granted to them by Charles I. Accordingly in 1630 they sold the manor of Lenton, with all due appurtenances, excepting an annual fee-farm rent of £94, which had been reserved by the Crown, to William Gregory, gentleman, one of the aldermen of Nottingham, for the sum of £2,500. Much curious and interesting information is given about Lenton Priory, which was founded by William Peverel in honour of the Holy Trinity, in the reign of Henry I, and between the years 1103 and 1108, the exact date being unknown. It belonged to the Clugniac order - a reformed congregation following the Benedictine rule. Peverel endowed the monastery with the town of Lenton, except four mills, and the towns or hamlets of Radford, Morton and Keighton besides other property in Notts., Northamptonshire and Derbyshire. He also gave the church of St. Mary, described as being in the English borough of Nottingham, with its lands and tithes, and the churches of St. Peter and St. Nicholas, described as being in the French borough of Nottingham, besides others more distant. Probably the latest instance of an assize of Darrien Presentment occurs in connection with Lenton Priory. It was a common practice in the 12th century to decide legal claims by the sword and to have champions for that purpose. 'One of the latest instances on record, and perhaps the only one where a church was the object of contention, occurred in 3 Edward III (1329), between Thomas, son of Hugh de Staunton, plaintiff, and the prior of Lenton, defendant. 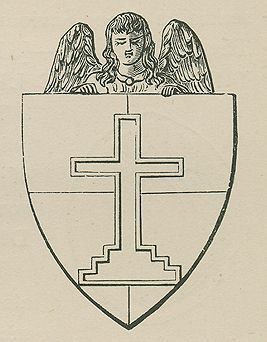 The plaintiff in support of his claim to the advowson, The Arms of Lenton Priory.alleged that in the time of Henry III, his ancestor, William de Staunton, being seized of it in fee, presented one William de Grendon, who was admitted and instituted to the rectory; while the Prior of Lenton rested his pretensions on the grant of William Peverel. Both parties agreed to submit the decision of their cause to single combat, and William Fitz-Thomas was appointed champion for the former, and William Fitz-John for the latter.' 'The combat did not, however, actually take place, for after the champions had been sworn at the bar, according to ancient custom, and were ready to advance, the parties obtained a licence of agreement, whereby Staunton released and quit claimed all right in the advowson for himself and his heirs to the prior and his successors for ever.' Among the numerous benefactors to Lenton Priory appear the De Buruns, ancestors of Lord Byron, who made considerable grants to it in the reigns of Stephen and Henry II. But these gifts led to considerable litigation between the Knights Hospitallers of St. John of Jerusalem and the Priory. In 1224 a singular mark of royal confidence was bestowed on the then Prior of Lenton (Roger) in that he was sent by Henry III to France, together with the Master of the Temple and the Chancellor of London, to make a truce with Louis VIII. The expenses of the Prior of Lenton on this occasion amounted to ten marcs (£6 13s. 4d.). About the only records now in existence which throw any light on the internal affairs of the Priory are contained in the Clugny MS., in the Bibliotheque Nationale, Paris, translations of which are here printed for the first time. In one of the extracts, dated 1276, the following curious report of the condition of the Priory is given by the visitors appointed for that purpose: -'On Friday next before the Feast of St. Peter in Cathedra, we visited Lenton. There are twenty-seven monks, and four lay brethern. The house owes a thousand and four marcs, nothing at usury. As to saddle-backs, shoes with latchets, eating of flesh, reading in the infirmary, and staying (up) after compline, we ordered as at Montacute. We found, also, that the lay brethern wore cloth of russet; we ordered that in future they should wear gowns blacker than usual. We corrected what ought to be corrected.' Three years later (1279) the visitors from Clugny Abbey were again at Lenton, and were able to report a better state of things, the Prior having apparently resigned in the interim. It would seem that the great indebtedness of the house mentioned above was owing to the prolonged law suits, in which it had been involved. From a complaint made to the King about this time (1275), it appears that the inhabitants of Nottingham suffered at that early period, as some portion of them do now, from the flooding of the meadows below the Castle of Nottingham and the meadows of the Prior of Lenton, on account of a certain weir made by the King 'beyond the water of Trent.' About the year 1289 the Prior of Lenton, Peter de Siviriaco, seems to have been deprived of his office, and replaced by one of his monks, one Ranandus. This led Pope Nicholas IV to send a bull to Edward I on the Prior's behalf. And with this we must close our present notice. Occasionally Lenton Priory appears to have been the temporary abode of Royalty - probably when the King was visiting Nottingham; but as the only record of these visits that has come down to us is accidentally preserved in letters dated from the Priory, we should hardly be justified in supposing that the list of these visits mentioned in the work before us represents the full extent to which the monastery was thus favoured. In 1302 Edward I addressed a letter, dated at Lenton, to Henry, King of Spain, on the proposed marriage of Prince Edward of England with Isabella, Infanta of Spain. In the following year the King was again at Lenton, as we learn from other letters addressed from there. In 1307 Edward II was a witness at Lenton Priory to the renunciation by Walter de Jorz, Archbishop of Armagh of 'all claim to the bulls of his appointment which were prejudicial to the King's power.' Among the other witnesses to this renunciation were the Patriach of Jerusalem, J., Bishop of Chichester; Henry de Lacy, Earl of Lincoln; V., Earl of Hereford; Thomas Plantagenet, Earl of Lancaster; and the author suggests that 'the Prior of Lenton at this time must have been an important and wealthy personage, not only to be honoured by such guests, but to possess the means of entertaining so distinguished an assemblage.' The first and only occasion when the Prior of Lenton appears to have been called on by the King to provide soldiers for the Royal Army was on February 16th 1322, when he was requested to raise as many men-at-arms and horse and foot-soldiers as he could to march against the rebels or adherents of the Earl of Lancaster, who was then laying siege to Tickhill Castle. The muster was to take place at Coventry on the 28th of the same month, and a few days afterwards the battle of Boroughbridge put an end to the rebellion, and the Earl of Lancaster was executed, along with many of his adherents. The writ containing this command is given in full in the original Latin, as are many other ancient writs, letters and charters, translated and untranslated, in various parts of the work. Indeed it would have been better if translations had been given of more of them. According to John Capgrave who flourished 1393-1464, Lenton Priory was the meeting place of the captors of Roger Mortimer, at Nottingham Castle, in the year 1330. Capgrave gives the following quaint account of the affair: - 'In the IIII yere was a Parlement at Notyngham; where Roger Mortimere was take be nyte in the qween chamber behinde a corteyn. It is seid comounly that there is a weye fro the hous of Lenton onto the castle of Notyngham, under the ground; and this wey cam thei in that took him, of whech the principales were too Ufforthis. The queen was logged in the castelle, and this Mortimere next hire, and the Kyng forth in the court. The keyes were in the keping of Mortimere. So these knytes, whan they were com into the castelle, thei cleped up the Kynge, and told him Mortimere had ymaged his deth, that he myte be Kyng; thei told him eke who he mysused his moder the queen, and thei broke up the dore, and fond him behinde the cuteyn, as we saide, and sent him to London, and there he was ded.' Other and more recent writers, however, assert that the expedition started from the residence of Sir William Eland, at Algarthorpe, in the parish of Basford. This was Eland Hall. We are not told where Eland Hall was precisely situated, perhaps because it lay outside the parish boundaries, but it seems to have been located close by the Leen, and somewhere in the older part of New Basford. From an account of a curious action relating to the repairing of a pyx - the box in which the host is kept in Roman Catholic Churches - brought by the Prior of Lenton in 1355 against Walter le Goldsmith, of Nottingham, contained in the records of the Borough Court, we get some idea of the splendour and value of the sacred vessels used in the conventual church. The Prior, through his attorney, complained that the said Walter had agreed 'to repair a vessel of crystal to carry the body of our Lord Jesus Christ, with pure silver and gold,' and that the same Walter had broken the agreement 'in not making the said vessel of pure silver, nor well and suitably gilding it, and soldering the aforesaid vessel with tin, whereas he should have soldered it with silver, to the serious damage of the said Prior of 180 shillings.' This, however, the defendant denied, and affirmed that 'he repaired well and suitably the aforesaid vessel.' Furthermore he was ready to verify his statement 'by a good inquest.' Therefore a good inquest was ordered to be summoned against the next court. At the next court the matter seems to have resolved itself into a question of debt, and the Prior complains that the goldsmith 'unjustly withholds from him a noble and a half penny of gold, and unjustly because, whereas the said Peter, the Prior ... by his servant, delivered to the same Walter two nobles of gold to gild a vessel of crystal with, to carry the body of our Lord Jesus Christ which vessel he gilded with a halfpenny; the same Prior, by his aforesaid servant, came and sought the aforesaid noble and half penny; the same Walter would not pay them, but withheld them, and withholds them up to this time, unjustly, to the damage of the said Prior of a hundred shillings.' This also Walter denied, and he retaliated by bringing an action against the Prior for 36s., which was the sum agreed to be paid for the work done to the pyx, and which the Prior had declined to hand over. In 1455 Henry VI appointed commissioners in various parts of the country to raise money for the defence of Calais. The commissioners for the county of Nottingham were the Prior of Lenton, Sir Thomas Chaworth, of Wiverton, Sir William Babington, of Chilwell, Robert Clifton, of Clifton, and Richard Willoughby, of Wollaton. In the following year John, Prior of Lenton, was licensed by the Archbishop of York to marry Gervase, son of the above-named Robert Clifton, Esq., and Alice, widow of Richard Thurland, of Nottingham, in the private chapel of Thomas Neville, Esq., at Rolleston. This Gervase Clifton was, as we are told in a footnote, afterwards knighted, and became High Sheriff in 1472, in 1478, and again in 1483. Nothing connected with either the parish or Priory of Lenton, seems to have given rise to such a lengthened controversy or to so much speculation as their origin as the 'Rock Holes' by the old course of the Leen in Nottingham Park. Blackner thinks they 'were originally hewn and set apart as places of worship for the ancient The Rock Holes in Nottingham Park - the remains of the Chapel of St. Mary le Roche.Britons.' Recent writers have advanced the opinion that they are of Roman origin, the larger cave representing the place of incineration, and the smaller one at a higher level, the columbarium, or 'dovecote' which contains from 150 to 160 cells, as receptacles of the urns containing the ashes of the dead. 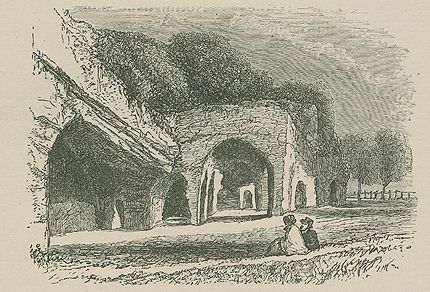 Mr Godfrey, however, shows that these caves probably form part of the ancient establishment of Carmelite friars who were located at this spot, or at any rate not far from it, in the reign of Edward I. This establishment was called the Chapel of St. Mary le Roche, doubtless in allusion to the rock out of which it was excavated, and was probably identical with the cell described in the reign of Henry III as being 'under the Castle of Nottingham.' At one time this chapel seems to have belonged to Lenton Priory, but 'later it passed into the hands of the King, for in 1475 we find Edward IV, making a grant of the reversion of the chapel in Tickhill Castle to the Priory of Lenton in return for their gift of 'the chapel of St. Mary, called the Roche, and the lands and tenements within the new Park there, two closes, called the Rock closes, to the south of the water of Leene, opposite to the said chapel, and two small parcels of meadow adjoining the said closes, together with their rights of three cart loads of wood a day in Beskewood, in the forest of Sherwood.' On the other hand, the convent agreed to provide a monk to say mass in the chapel of St. Mary of Roche, for the good estate, &c. of the King and his house; and likewise to oversee and take care of a small boat on the Leen water, and a garden near the said chapel. There is a woodcut, showing the rock holes as they appeared many years ago, when they were much more perfect than they are now. In Dame Agnes Mellers' foundation deed of the Nottingham High School it was ordained that if the Mayor and Corporation should neglect to appoint a schoolmaster and usher within forty days after those offices became vacant, or appropriate the income of the school to other uses than the support of the school, the guidance and oversight of all these matters was to devolve on the Prior and convent of Lenton for the time being, and their ancestors. The last Prior of Lenton was Nicholas Heth, or Heythe, who according to tradition, was hanged before the Priory gateway for refusing to acknowledge the supremacy of the King (Henry VIII). This gate-house stood across what is now Wilford-road, near the end of Abbey-street, and was in existence down to the Drawings of some of the bits of masonry found from Lenton Priory.early part of the present century, part of it being occupied for parochial purposes up to the time of its demolition. An inquiry into his possessions was held at Nottingham on September 3rd 1358, when the whole of the property belonging to the Priory was confiscated to the King. We now come to what many will look forward to as the most interesting part of the book, namely the account of the Priory remains. The Priory buildings were so completely demolished, however - probably, as Mr Godfrey suggests, on account of the scarcity of building stone in the district - that the traces still left, or that have been found on the site, are the most meagre description, and the result is disappointing. If it had been ordained that not one stone should be left standing upon another, the destruction of the conventual establishment could not have been more complete. Any attempt to restore, in imagination, or on paper, the architectural character or ground plan of the Priory is therefore impossible. Mr William Stretton, architect and antiquarian, who, about the middle of the last century, erected the modern 'Priory' on the site of the Prior's lodgings, did attempt by means of excavations on the Priory site to trace the plan of the ancient buildings, and succeeded in digging out 'seven very fine specimens of the ancient pillars, to the height of several feet above their bases,' and was also 'enabled nearly to trace out the ground plan of the whole.' Mr Stretton left many MSS. 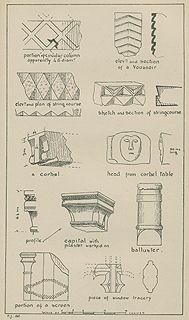 notes behind, which contain several sketches of masonry found on the site of the Priory, but it is to be regretted that these interesting details are not to be found amongst them. 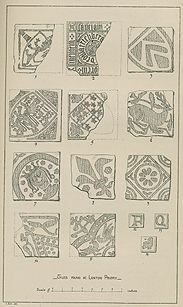 Drawings of some of the encaustic floor tiles found from Lenton PrioryMr Godfrey, however, has made the most of the materials within his reach, and has been able to illustrate his description of the Priory remains with two plates showing the character of the sculpture, a plate showing the encaustic tiles found on the site, and another plate containing the antique keys found there, besides several wood cuts. There is also a plan of the Priory site as it exists at the present day. The only remains of the ancient Priory that still occupy the site in their original position are the bases of two pillars in a garden at the corner of Priory-street and Old Church-street, now the property of the Rev. Kirke Swann M.A. of Forest-hill, Warsop. The bases are five feet in diameter and five feet apart, and exhibit the base mouldings entire. The foundations of two other similar pillars have been found alongside these by digging, at the same distance apart, and forming a square. These pillars are supposed to have formed part of the great calcefactorium, which was a chamber provided with a fire-place or stove, and used as a withdrawing-room by the monks. 'On the south side of the old church yard some massive fragments of masonry, from which the external ashlar casing has been removed, remains, which are supposed to have formed part of the wall of the north transept of the great conventual church. The most interesting relic of the ancient Priory, however, is the baptismal font which is now in the church at New Lenton. It is considered to be one of the finest and most perfect examples of Norman work remaining in this county. It is square in shape, and the sides contain sculptured representations of the crucifixion and the descent from the cross, in which many figures are introduced. But should not this font have been mentioned along with the rest of the Priory remains, and not have been described in connection with the modern church in another part of the work, simply because it happens to be located there now? 'Between the conventual church and river Leen stood the Prior's lodge, beyond which stretching towards the south, were the Prior's orchards.' Judging from the fragments of the masonry that have been found on the site, and others that are scattered about the parish, it is evident that the Priory buildings were of a very massive proportions and of considerable size, and this impression is confirmed by the dimensions laid down by the ecclesiastical authorities of the Clugniac Order which were to be observed in the erection of the monastic buildings. The style of architecture seems to have been early Norman. The seals of the Priory are here engraved for the first time from the originals in Lichfield Cathedral. 'Within the courtyard of the Priory there was a hospital for the free and charitable sustentation of such as should be troubled with St. Anthony's fire.' Very little is known of this establishment but 'there is a tradition that after the suppression of the monastery, the chapel of the hospital was converted into the parish church,' and the discoveries made during the recent restoration of this church tend to confirm the tradition; at any rate it is now certain that the chancel of the present church formed part of the ancient edifice that stood on this site.